Anya’s Ghost by Vera Brosgol. First Second Books, 2011. Currently available. Here’s the thing about an endorsement from Neil Gaiman. I am a huge Neil Gaiman fan and would read almost anything he recommends. Actually, slap a Neil Gaiman quote on anything and I’d probably buy it. On a box of cereal: “Surprisingly crunchy.” –Neil Gaiman. On a pair of shoes: “Excellent arch support.” – Neil Gaiman. Yeah, that cereal and those shoes are going home with me. So, in a roundabout way, what I’m trying to say is that this book already had a great cover going for it, and the endorsement from a literary rock star just made it all the more excellent. Unfortunately, I didn’t buy the book that day because I was short on cash – but then I received it as a gift a month later. I was so excited when I opened up that package. Does it break the slate? Heck yes. Anya struggles with decisions that a lot of teen girls have to make, and comes out on the other side feeling better about herself. Also, when it comes time to deal with her little problem, she handles it all on her own – no adults, no prince charming swooping in at the last minute, no Ghostbusters – it’s all Anya. She is an outstanding character, especially in the graphic novel world. Who would we give it to? Every teen girl who has every struggled with body image issues. So, basically every teen girl. Adding to the frustration of Anya’s teen existence is the fact that she is a Russian immigrant. Although she has mastered English, she still finds herself moving on the fringes of society while at school. Add to the mix the fact that Anya does not yet feel comfortable in her curvy, womanly figure, and you have a lot of factors for a teen girl to deal with. Anya escapes her problems by ditching class and smoking with her sort-of-friend Siobhan. She’s a sort-of-friend because she is the only one who hangs out with Anya, but she’s the kind of friend who is partly an enemy – she criticizes Anya’s choices and constantly puts her down. One day while wandering into the woods, Anya falls into an abandoned well and is trapped. While she’s stuck down there, she meets some company – the ghost of a young woman who has been dead for ninety years. As soon as Anya is rescued, she thinks she is free of ghostly experiences – but then the ghost starts hanging out with her. All of the time. 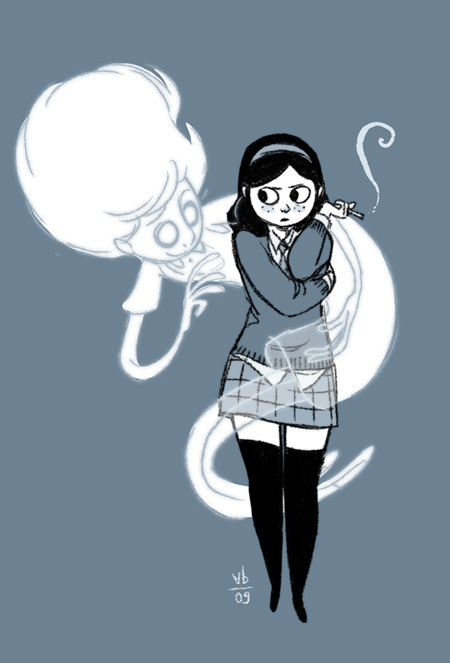 At first, Anya enjoys the companionship because Emily (the ghost) becomes the caring friend that she needs in her life. But Emily’s attentions increase in fervor and suddenly she is ordering Anya around and pushing her to do things she just is not comfortable with, including dressing up in revealing clothes to win over a guy. Emily goes from sweet to terrifying at just the right pace. Brosgol builds up our trust in the character and then quickly tears it down – and this is all done with the perfect balance of dialogue and images. The final showdown between Anya and Emily is satisfyingly creepy and builds to a climax that readers will not soon forget. 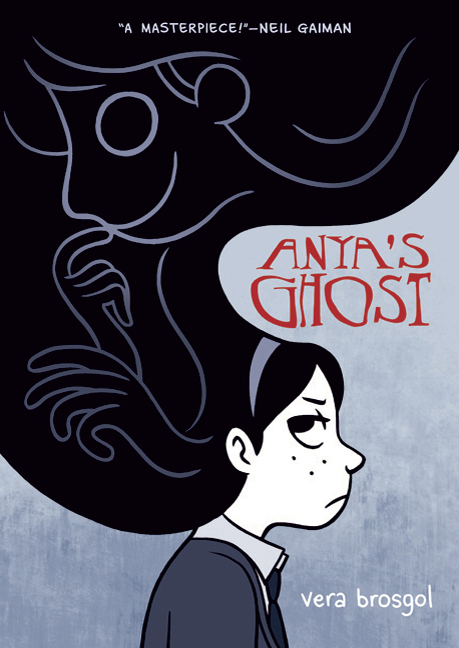 After the smoke clears from her ghostly experience, Anya decides to make a few small changes in her life. Although they are minute, they make a big difference in the way she perceives herself. I think that’s what I love the most about Anya as a character – she makes the changes for herself, not for others. Even though I have moved past the rocky road of adolescence, it was still affirming to read about a young woman who learned to take pride in herself. Thank you, Vera Brosgol, for bringing a character like Anya into the world. Reviewed from a copy I received as a gift from Peter – thanks Peter! 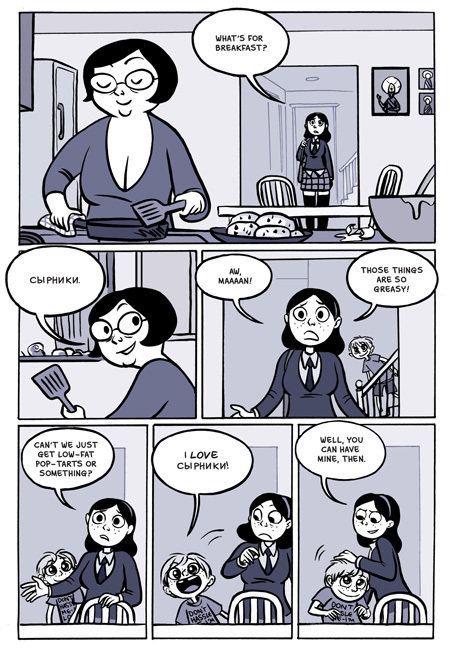 This entry was posted in Graphic Novels, Reviews, Uncategorized, Young Adult and tagged Adolescence, Body Image, Ghosts, Graphic Novel, Neil Gaiman, Vera Brosgol, ya. Bookmark the permalink.